Little has been written about Charles Obach, the manager of the Goupil gallery in London, where the 20-year-old Vincent van Gogh came to work as an assistant in 1873. But now we know what he looked like, thanks to a newly discovered studio photograph in the collection of the National Portrait Gallery. There could hardly be more of a contrast between the images of the dealer and his young assistant. Obach, in his thirties, is the epitome of a successful man, confidently leaning on an ornate chest, with a backdrop of classical columns in a garden setting. With one hand in his pocket, he nonchalantly looks towards the camera. Van Gogh appears ill at ease in his jacket and waistcoat. His tie seems a little loose and although sporting a similar hair style to his boss, it gives him a scruffy appearance. 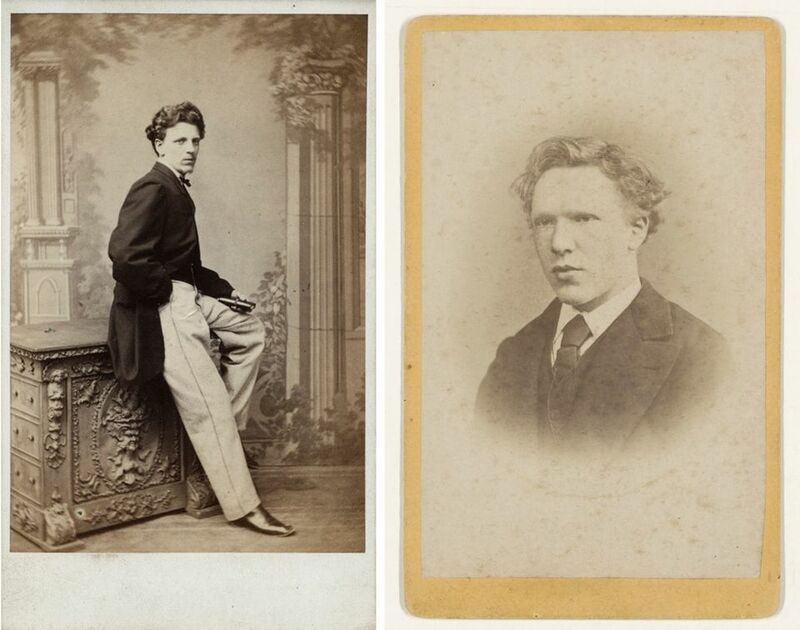 This is the only proper photograph of Van Gogh as an adult (one other shows him at a distance from behind). In fact, Vincent hated portrait photography. He once wrote to his brother Theo to reiterate that “I myself still find photographs frightful and don’t like to have any, especially not of people whom I know and love”. Photographs, he added, “are faded more quickly than we ourselves, while the painted portrait remains for many generations”. Obach, Van Gogh’s boss in London, was a fellow Continental. The son of a Swiss artist, Kaspar Obach, he was born in Stuttgart in 1841 and had come to London in the early 1860s to work for the Goupil gallery, in Covent Garden, taking over as manager a few years later. Initially Obach was kind to his new assistant. A month after Van Gogh’s arrival, he and his wife Pauline invited him on a Sunday excursion to Box Hill, in Surrey. At Van Gogh’s first Christmas away from home, he joined the family celebrations at their house in Brixton Road. But unfortunately Van Gogh turned out to be an awkward employee, lacking tact, and he was poor at dealing with customers. On two occasions Obach helped arrange for him to be temporarily transferred for some weeks to the company’s head office in Paris, hoping that the change would prove positive. But this did not improve matters and in January 1876, during Van Gogh’s second stint in Paris, he was sacked. It was the owner of Goupil who actually dismissed him, but this was after Obach had reported on his disappointing performance in London. As for Obach, he left Goupil in 1884 to set up his own gallery in London, Obach & Co, specialising in late 19th-century Barbizon and Hague School artists. Despite his enforced departure from Goupil, Van Gogh still retained some friendly feelings towards his old boss and they once met briefly in The Hague in 1881. Following Vincent’s suicide in 1890, Obach wrote a note to his brother Theo, expressing his “heartfelt condolences on this distressing occasion”. In 1911, Obach’s gallery was merged into the long-established company Colnaghi, which for three years operated as Colnaghi & Obach, before the Obach name was dropped. Obach died in London in 1921. Van Gogh’s period in London will be covered in depth in Tate Britain’s The EY Exhibition: Van Gogh and Britain (27 March-11 August 2019).